To promote awareness of the role of surveyors in land administration matters to the public and among stake holders. The Commission 7 Annual Meeting will take place in Seoul, Korea 5-9 August 2019. 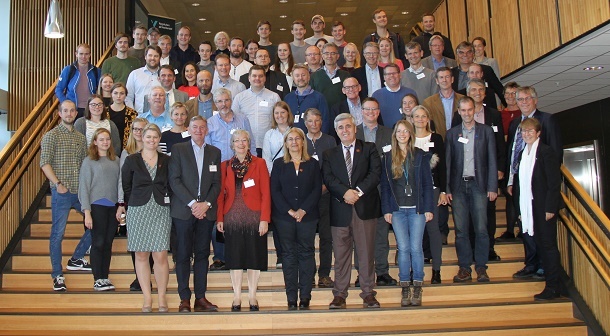 Around 100 participants from all over the world followed the invitation to join the FIG Commission 7 Annual Meeting and the international Seminar organized by the Norwegian FIG member association TEKNA in Bergen, Norway. 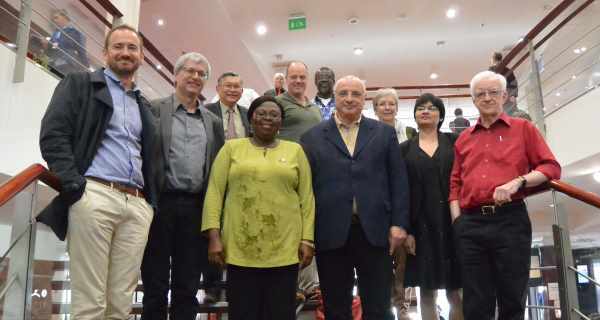 Dear Delegates, Correspondents and friends of FIG Commission 7! The well attended national IMPULS project workshop on „SDI Raising awareness – benefits from IMPULSE Project to SDI FBiH and further development“organized by the Federal Administration for Geodetic and Property Legal Affairs was held in Sarajevo on 5 and 6 December 2018 in the premises of the Hotel Holiday. 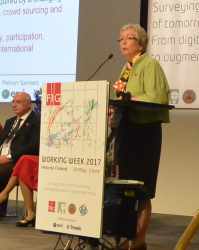 FIG was represented by Chair of Commission 7 Ms. Gerda Schennach who delivered greetings from FIG President Ms. Chryssy Potsiou and Vice-Chair of the Commission Mr. Gyula Iván (HU). The Director of the Federal Administration for Geodetic and Real Property Affairs, Mr. Željko Obradović opened the workshop and welcomed all participants, and pointed out the importance of sharing data. Mr. Tomislav Ciceli presented the IMPULSE project and its benefits for the SDI FBiH, Mrs. Slobodanka Ključanin presented Spatial Data Infrastructure of the Federation of BiH and results achieved so far. FIG Commission 7 presentations were about Win-Win solutions for national and international activities on Cadastre & Land Management by the INSPIRE Directive and about experiences of the implementation of INSPIRE theme Cadastral parcels in Hungary. Mr. Vladimir Krupa, member of the CLGE Executive Board highlighted in his speech the importance of authoritative data and public appointed professionals and the benefits from civil servants/private surveyors models in cadastre. The second part of the workshop emphasised on the Register of subjects, Register of data sources and Metadata editor which was presented by Mr. Nikola Cvjetković and Mrs. Amela Huković. Mr. Nedim Hadžiosmanović presented the complexity of the establishment of a national SDI and the role of the municipalities being in charge of cadastre in its implementation. It is a great pleasure to invite you to the FIG Commission 7 Annual Meeting 2018 and International Seminar being held at the Hotel Zander K, Zander Kaaes gate 7, 5015 Bergen, Norge, Europe. The venue for the Annual meeting 2018 has been decided as on the excellent air links to many other countries inside and outside Europe at once the colorful Norwegian city of Bergen offers many cultural highlights and is also considered a gateway to majestic fjords. Norway, the country of northern Europe, occupies the western half of the Scandinavian peninsula. Nearly half of the population lives in the extreme south, in the region around Oslo, the capital. About two-thirds of Norway is mountainous, and of its much articulated shoreline carved by deep glacier fjords are about 50,000 islands. Accompanying persons are very much welcome to attend the social events and excursions. Thanks to the organizing committees Tekna and Geoforum under chairmanship of Mr. Leiv Bjarte Mjøs, for providing the opportunity to meet to Norway. Looking forward to meeting all of you in Bergen! Dear Commission 7 Delegates, Correspondents and friends! Only few days are left in 2017 and this is a good reason to review the year and to have a look ahead to 2018. Looking back to the two main events of Commission 7, I want to express a special thank to our colleagues in Finland for their continuous support in organising the Commission 7 events in the frame of the FIG WW in Helsinki and to our Colombian colleagues, Daniel Paez from the University de los Andes in Bogota and his team of young surveyor and students, who organised an excellent and very well attended Annual Meeting and Conference in Cartagena. For the first time we had the possibility to join the events in a teleconference service, which was even more helpful as Daniel Steudler and myself got stranded in Frankfurt airport being booked on one of the 250 flights which had been cancelled that day due to bad weather conditions. These are the challenges – hurricanes, wizards, snow and other natural hazards make it sometimes difficult to make use of all facilities to get to all places around the globe! Thanks to the young team who made attendance happen in this situation. You will find all presentations of both events at fig and at http://fig717.net/en/home-2/. A more detailed report will be circulated at the beginning of the next year. The highlight of 2018 will be the FIG Congress in Istanbul to be held on 6-11 May 2018. Registration is already open and up to now 450 papers have been applied for, 150 of them directly connected to Commission 7 topics – again there will be the need to run a considerable number of Technical Sessions in parallel. Besides there will be among others a special half-day side event on cadastre of the Turkish talking countries, from where we expect around 100 persons to attend. A more detailed agenda for the Commission 7 technical and social events will be circulated in a few weeks and may be found on https://www.fig.net/fig2018. 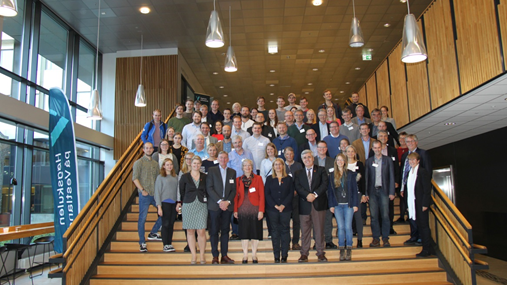 The Annual Meeting of Commission 7 including an international Workshop will be held in autumn 2018 most likely from 24-28 September 2018 in Bergen/Norway. Thanks to our Delegate Leiv Bjarte Mjøs who is committed to organize the event and who has already made some arrangements to make sure that the costs will stay at our average level of previous years. All details about the Annual Meeting and other events co-organised by Commission 7 are continuously updated at www.fig.net: Please make sure that any event which is attended by FIG Commission 7 members gets published on this website by sending a note to me. Finally, I want to thank all of you for your participation in and as FIG Commission 7 representatives and for activities taken for FIG Commission 7. Your contribution in conferences, workshops, all kind of publications and many other initiatives is a most valuable contribution to spread the spirit of FIG and especially for us in Commission 7 to provide the society with a solid fundament for secure and fair land tenure and land registration in all countries all over the world for the benefit for society and land owners. Especially in those times of all kind of challenges on land, expertise which is built on professional skills and on independent assessment of the situation, is of high relevance for a peaceful coexistence. Looking forward to meeting all of you in 2018. The FIG Commission 7 Annual Conference and Meeting is taking place between 4 – 8 December 2017 in Cartagena, Colombia. This event will also host a conference focused on Cadastre for emergencies and disasters: Challenges and opportunities for islands and coastlines. The FIG Commission 7 Annual Conference is the meeting par excellence that brings together surveyors from around the world so they can share and learn about the latest developments in cadastre and land management as well as contributing experience and knowledge in terms of their environments and individual activities. It is a one-off opportunity for participants from all over the world –both professional members of the FIG Commission 7 and interested members of the public– to share their points of view. Those who participate in the conference will be able to go to a gala dinner and visit the important tourist sights in Cartagena. You can also try traditional dishes from the Colombian Caribbean region and take a walk on the beautiful beaches. Cartagena de Indias is located on Colombia’s north coast and it has beaches that are renowned for their beauty and tranquillity. It also hosts architectural gems such as the citadels that were built in the Colonial Period that have now been restored. In 1984 the city was declared an UNESCO world heritage site, which made it one of the most-visited Colombian and Latin American cities. This questionnaire that has been developed by representatives from Commission 7 and 9 who are seeking input regarding the LADM expansion module. This is an ongoing research which aims at developing a LADM based international information model for property valuation, namely an ISO LADM Valuation Module for the specification of registries used in immovable property valuation. 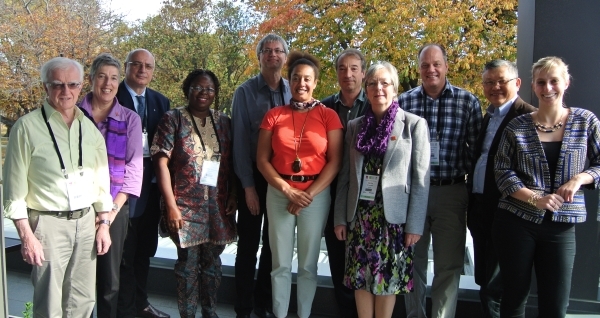 The FIG Commission 7 Annual Meeting was held in Coimbra, Portugal in October. The meeting was successful and the attendees met up and heard first-hand about cadastral developments in different scenarios, to share experiences, and learned about what is happening in this particular sector of activity. Symposium on Land Consolidation and Readjustment for Sustainable Development - Designing Resilient Landscapes and Empowering Communities. The symposium will be co-organised by FIG, FAO, Dutch Kadaster and LANDNET. The symposium provides a unique opportunity to share your knowledge and experiences with fellow scientists and practitioners working on land consolidation and land readjustment from all over the world. There is an attractive programme with a mixture of keynotes, technical sessions, field trips and social activities. The symposium will be held in Apeldoorn, The Netherlands, 9-11 November 2016. A new version of Cadastral Template has been launched, developed by a research group at the Centre for SDIs and Land administration, Department of Infrastructure Engineering of the University of Melbourne led by Professor Abbas Rajabifard, Dr. Daniel Steudler, and Professor Ian Williamson, supported by Professor Stig Enemark from Aalborg University, Denmark. 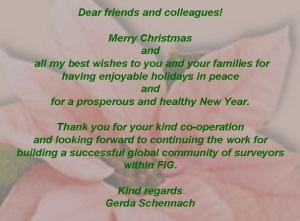 At the end of this year, I want to thank all of you for your support for and for your contributions to the work of FIG Commission 7 in order to raise awareness on land rights, to secure or/and improve rights on land and to support interest groups wherever it is necessary. Establishing contacts and co-operating with professionals in all regions all over the globe will bring us forward in implementing tools which are appropriate to meet these goals. 2016 will continue with as many events as in 2015, where Commission 7 representatives will play key roles! Don't miss to register before 8 February 2016 in order to get the discount of 90 EUR off the standard registration fee. The Commission 7 Annual Meeting including an international Seminar will be held in Coimbra, Portugal, 23-28 Oct 2016. Our Portuguese colleagues have already started with preparations for these events. A first announcement including information on travelling, accommodation and technical programme will be sent out in spring. I do hope to welcome as many partners of the Commission 7 community as possible in both events! For the moment, please take my best wishes for a Merry Christmas and a happy New Year! Looking forward to working for a successful 2016. Ms. Gerda Schennach, Chair of commission 7 making his report to the General Assembly Commission 7 had its annual meeting during the FIG Working Week 2015 in Sofia, Bulgaria, 17-21 May 2015. The FIG Commission 7 Annual Meeting and GeoConference 2014 will take place 7-11 October, Qu?ec, Canada. LADM audience focussed Over 40 participants attended the workshop and a total of 25 peer reviewed papers were presented, covering a range of themes, including: the industry perspective on LADM; the linkage between LADM and information infrastructures; refined LADM modeling, 3D representations and formalizing LADM semantics; specific LADM country profiles; and implementation aspects.